Going digital without any goop! City of Lights Dental has invested in the iTero element scanner. Going digital with the iTero scan means eliminating gooopy impressions! The iTero element allows your dental professional to take a digital scan of your teeth and automatically sends it to the lab. The iTero element scan is designed to put the latest technology at their fingertips and making intraoral scan fun, not just for your dental proffesional but for our patients too! The iTero scan is used for Invisalign, bridge, and restorative crowns. Invisalign is a system that uses customized aligners to straighten teeth. Please feel free to ask any questions you might have about our new iTero element scan system! When X-rays pass through your mouth during a dental exam, more X-rays are absorbed by the denser parts (such as teeth and bone) than by soft tissues (such as cheeks and gums) before striking the film. This creates an image on the radiograph. Teeth appear lighter because fewer X-rays penetrate to reach the film. Cavities and gum disease appear darker because of more X-ray penetration. 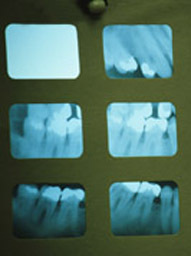 The interpretation of these X-rays allows the dentist to safely and accurately detect hidden abnormalities. How often dental X-rays (radiographs) should be taken depends on the patient`s individual health needs. It is important to recognize that just as each patient is different from the next, so should the scheduling of X-ray exams be individualized for each patient. Your medical and dental history will be reviewed and your mouth examined before a decision is made to take X-rays of your teeth. The schedule for needing radiographs at recall visits varies according to your age, risk for disease and signs and symptoms. Recent films may be needed to detect new cavities, or to determine the status of gum disease or for evaluation of growth and development. Children may need X-rays more often than adults. This is because their teeth and jaws are still developing and because their teeth are more likely to be affected by tooth decay than those of adults.